Join Live Art Dance for our final show of the season: VIC'S MIX by Montreal's RUBBERBANDance Group! Special thanks to our fabulous show sponsor Studio In Essence Ltd., and our season sponsor Gordon Stirrett Wealth Management. 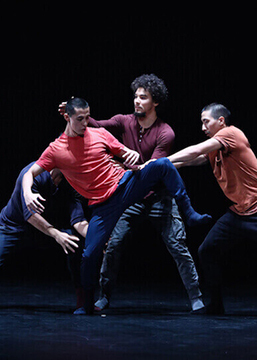 Vic's Mix is the first phase of a major project initiated by choreographer Victor Quijada. RUBBERBANDance Group will soon celebrate its 15th anniversary. This new creation is intended to highlight the essential innovations of Victor Quijada’s choreography, synthesizing the fruitful results of his experiments in dance over a decade and a half. Through the prism of Victor’s influences, stretching from hip-hop in his first forays to his mastery of contemporary tendencies, Vic's Mix will be a watershed moment, constituting a bridge connecting the works realized until now and a look back at pieces that established the company’s choreographic identity. Vic's Mix will showcase excerpts from previous RUBBERBANDance pieces, notably, Elastic Perspective. The music for the production will based on original works composed by Jasper Gahunia for RUBBERBANDance Group and those of other composers. Tickets available online at www.liveartdance.ca or through the Live Art box office (902 420 0003).